While I don't have 'being green' as my main objective in life, I am starting to notice that we're becoming more green as time goes on. When I read articles that are more focused on being environmentally friendly than I am, I realized that as I go more towards feeding my family whole foods, our family is having much less of an impact on the earth. I do think it's a good thing to do, to reduce impact. As a Christian I am to be respectful of God's creation, not greedy, not wasteful. There's no doubt that just as I've come along to being more green as a result of trying to keep my family healthy, some people have come about eating traditionally prepared and raised foods as a result of wanting to have less of an impact on the environment. In The Omnivore's Dilemma sustainable farming is investigated, and how it has improved the land the farm is on in addition to providing food for many people. Just as we looked at back in the Dehydrating Almonds post there's a lot of 'mutual beneficialness' going on in traditional whole foods. Disposable diapers about 1/4 of the time. This by far is the worst. I was better at cloth diapering 100% of the time when I only had one child. Plastic shopping bags. Still haven't gotten my act together to ditch those. Food wrappers- mostly limited to sacks that held 10 lbs of flour, 10 lbs of apples, frozen fruit/veggie bags. Still occasionally get the applesauce cups. And the fruit leathers are individually wrapped. Ziplocks. I'm a little Ziplock-happy and should cut down on these. Minimal use of shampoo. I use shampoo every once in a while, so my last bottle lasted me over 6 months. Otherwise I'm using baking soda to wash. I always use vinegar as my rinse. 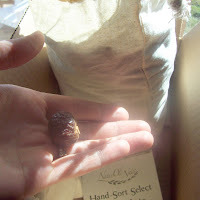 Soapnuts in my laundry- they work really well, no harmful chemicals, and have very little packaging (pictured). Don't use hair products. I just bought a bottle of shampoo at walmart (better go add that to my not-green list) the other day, and walked past so many products and things that I not only didn't need, but I had no desire to own whatsoever. Live in a small apartment- we're doing it for low rent while we pay off debt, but this also is green because it doesn't take much energy at all to heat or maintain. It's interesting to see how things are all connected- what's good for health is also good for the earth. How about you, what's the biggest 'green' change you've noticed since eating whole foods? Or have you come to learn more about cooking whole foods because you wanted to reduce your impact? 0 Response to "Eating Real Food has made us Accidentally Green"